Nauiyu is a small community situated on the banks of the Daly River, 220 kilometres south of Darwin. Our population of around 510 people is 86 per cent Aboriginal. The community has a store, school, health clinic and police station. The arts centre is a meeting place for the creation of paintings and craft as well as the host of the annual Merrepen Arts Festival featuring art sales, a sports carnival and music. Prior to European settlement, the Daly River area was a meeting place for Aboriginal people to trade and hold ceremonies. The traditional owners of the area are the Malak Malak people who live in Nauiyu and in the downstream community of Wooliana. 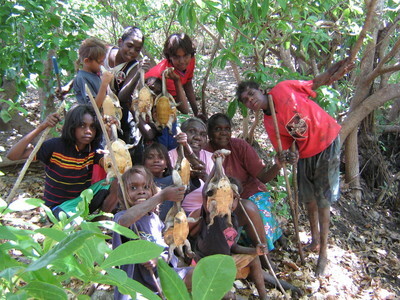 English is spoken by most residents, with Ngan’gikuruggurr being the most prominent of ten local languages. The Daly River region is popular for fishing and camping and encompasses many unique ecosystems including hot springs and gorges. The climate is typical of northern Australia with contrasting wet and dry seasons and regional flooding during the wet season.